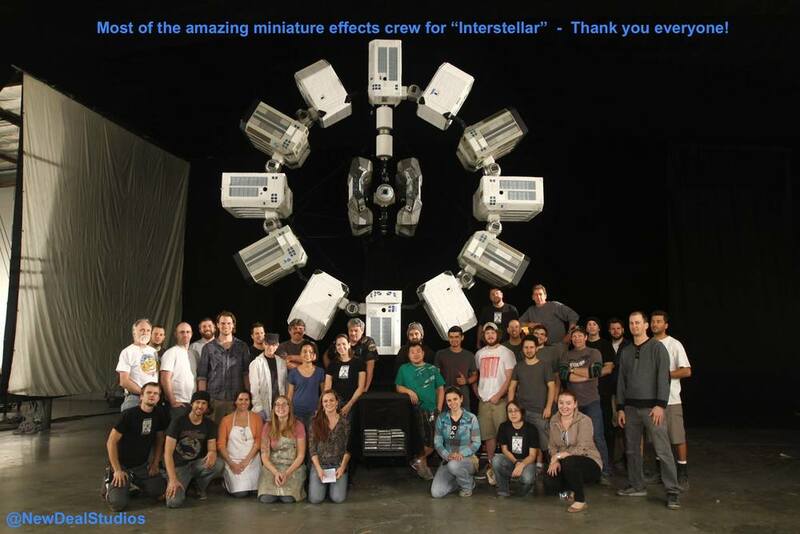 The amazing crew who contributed their creativity, heart and soul into the miniatures for INTERSTELLAR. The Endurance included two 1:15 scale Rangers and Landers, also known as the "full stack", and is 14 feet in diameter. We also fabricated 1:5 scale Endurance section for pyrotechnics and two 1:5 scale Rangers, one for pyro and the other for beauty shots. Adjusting the lights to the 1:15 Endurance. Note the mechanical rig that is designed to rotate the miniature. The Endurance was mounted to a rotating model-mover to create moving shadows during photography (pictured above). In the course of the story, various pieces, sections and parts of the complete Endurance were removed and interchanged with other mounting points. To capture the pyro event, the 1:5 scale Endurance section and Ranger were suspended 40 feet in the air, inverted and shot at high speed against the night. Pyrotechnic detonators were used to break apart the models, air cannon for debris, and pneumatic cables ratchets to pull the miniatures apart - all triggered with electronic micro-timers. Once again, thank you to the crew who helped make these shots look fantastic. The Oscar nomination is for all of us.